I have a Cisco Wireless LAN which is managed by a WLC appliance. Is there any way to obtain meaningful information from the appliance using PRTG? Are there built-in sensors I can use? This device's operation is very sensitive for my organization and we want to have additional monitoring so that we are alerted as soon as anything goes wrong. What are my options? I've attempted to use the MIB but had a hard time importing it and deploying any sensors. While PRTG provides a couple of sensors that work with the WLC controller by default, for example the SNMP Traffic sensor and the SNMP System Uptime sensor, but you may still be interested in more detailed sensors. You can use the device template that we provide below to automatically create custom sensors with the PRTG auto-discovery. The device template creates the available and compatible sensors based on the data at hand. The sensors implement default alerts whenever possible, but you can still fine-tune most channels by defining additional limits in the sensor channels settings or modifying the lookups included by default. If it works for you with a different model, please let us know! To monitor access points, the bsnAPSerialNumber is used for uniquely identifying and tracking individual access points. If an access point is renamed, the sensor's name will not be updated automatically. Either change it manually or delete the sensor and re-run the discovery. When more SSIDs are created or more APs are connected, re-run the discovery to monitor these. You can also use the Auto-Discovery schedule for this. If the SSID is renamed, the corresponding sensor will fail. Either update the name in the sensor's settings or delete the sensor and run a new auto-discovery with the template. 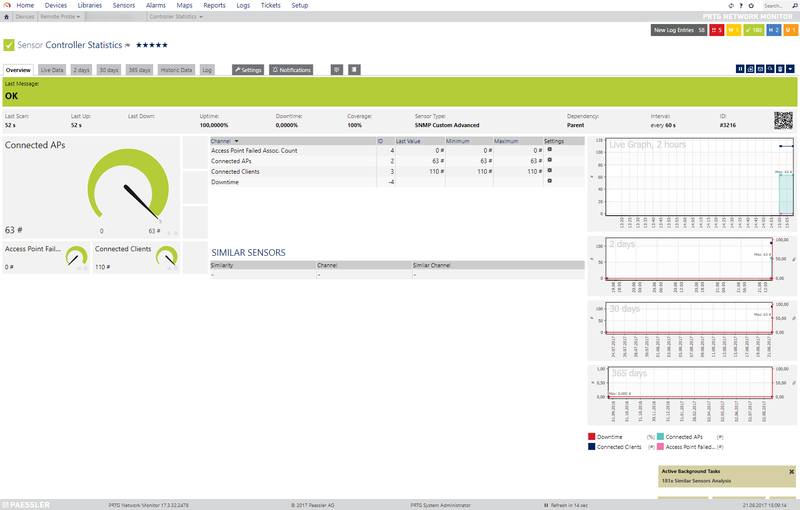 PRTG shows the alerts as reported by the monitored device via SNMP using lookups. 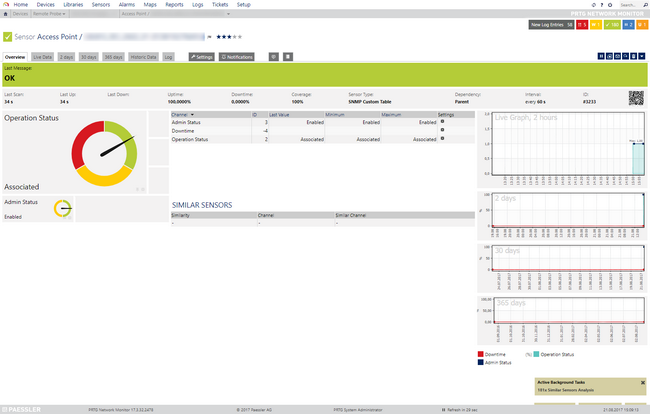 If the status is not reported correctly via SNMP, PRTG cannot detect any issues. For additional alerts, please set up limits for additional channels. This device template was created based on data collected from other customers, so we cannot guarantee that the sensors described above will work on your systems. Use these components at your own risk. Please test and validate the sensors in your environment after deploying them. Download the required zip archive here. Extract the archive to your PRTG program directory. By default, this is %Program Files (x86)%\PRTG Network Monitor\. 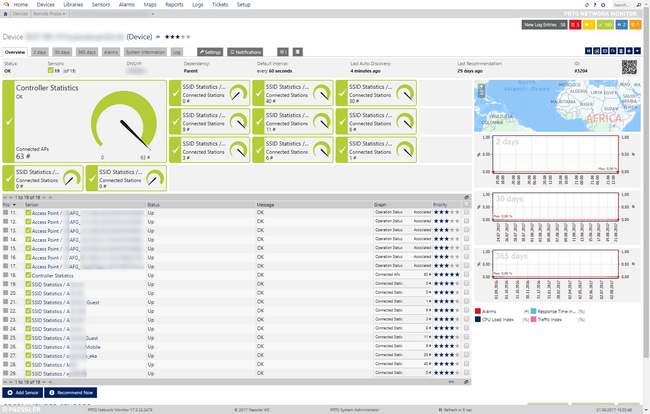 Right-click your new device, select Run Auto Discovery with Template, browse for wlc and select the Custom Cisco WLC Access Point Status v0.2 and Custom Cisco WLC SSID Statistics v0.2 templates from the list. You can adjust the channel limits or lookups to your needs later. Please read ahead for troubleshooting. Have any issues? Please don't hesitate to contact us by replying to this post or via a support ticket. Please make sure to mention this KB post. Please read ahead for troubleshooting steps that you can take in advance. In the example above, some sensors were skipped because the device did not respond to the snmp_bsnDot11EssTable check. This means that this data is probably not available on your device. You can track this data by looking for the name after snmp_. In this case, a search for bsnDot11EssTable will tell you what OID from what MIB is missing. First of all, thank you both for posting this! I've tried a few times over the last few years to get useful information out of or WLC's finally! The template worked well for me, and I was able to get a comprehensive list of all of our AP's. I'm wondering how difficult it would be to get collect the client count for each AP? The ability to graph this over time would aid in capacity planning... a lot! I've tried getting the client count with this oid "OID=1.3.6.1.4.1.14179.2.2.2.1.15" using a bash script, but your help would be appreciated as I was never able to conveniently correlate this with the AP name. Look forward to hearing from you, and keep up the good work! This makes it very difficult to provide sensors with adequate naming/metrics using just the auto-discovery. While the SNMP Custom Table sensor is very powerful, it is not this flexible yet. For now only a built-in sensor would be able of handling this correctly, and unfortunately we don't have any WLC sensors on the roadmap for now. Depending on the number of access points that you have, you could deploy multiple SNMP Custom Table sensors (for many APs at once) or any number of SNMP Custom Advanced sensors to cover the relevant AP's, but this will require some elbow grease and patience to have everything looking/named the way you want. Since the "indexing" of the table uses the Mac Address and "slot id" (which should be fairly persistent) once deployed the sensors should be reliable, even without index change support (as there's no identification column in the table). Lastly, I want to point out that the SNMP implementation from the MIB is fairly good, the limiting factor here are the Custom Table Sensor's capabilities. While I understand that my reply doesn't really provide a solution to the issue/question, I hope that it at least makes clearer why we're not able to provide this (at least not at this point in time). Works also great with WLC 5520 Wireless Controller! I have applied this solution to monitor access points from a Cisco WLC deployment. It works very good for us. Is it possible to add some more information in the sensors of the Access Points? I would like to monitor the Radio description and Radio Status per Access Points. This object represents the AP's interface admin status. A value of 'true' indicates admin state as Up. A value of 'false' indicates admin state as Down. This MIB works for the Cisco 5508 Wireless Controller. Unfortunately that's not trivial, basically due to the same constrains/limitations as described here. an AP that has joined the controller. This means that we're not able to offer any short-term native alternatives for that. Can you expand on how you derive the OID value from the MAC address for use as an index identifier? In your example above, you were able to convert the hexadecimal MAC address into: 0.142.115.69.70.12. I'm looking for confirmation on how that is accomplished. Did you use a standard Hex base 16 to decimal base 10 conversion foreach "octect" of the mac address? Thus making the following true? hexadecimal SNMP values cannot be usefully converted with PRTG, especially if the value is built-up from multiple components. I would like to know which SNMP trap controls are activated on your WLC controller in order to get the sensors showing on your blog working please.? The template and sensors work with SNMP GET requests, it does not rely on trap messages. I did however expand the Requirements section of the post with two links related to the SNMP Setup for the controller. I had missed your earlier reply, sorry for that. I have no documentation to support my claim/belief, but I've seen this sort of implementation before and it "makes sense" to me. But I'm unable to confirm for certain what precise conversion is done but would also tip at hex base 16 to decimal base 10 as you've suggested. Since it will be hard to come by documentation that confirms this I encourage you to perform an snmp walk on an active WLC and confirm it by looking at the actual data. If the conversion checks out with hex base 16 to decimal then it's probably right. Confirmed working with Cisco 1815 Mobility Express as well. Many thanks for this! This also works for the Cisco 7500 Series WLAN Controller with IOS version 8.3.143.0. We are monitoring 1175 AccessPoints with this template. I am using this template for a while now and it works good for the Cisco WLC 5520 with version 8.2.167.6 but not when I apply this to Cisco WLC 5520 with version 8.5.135.0. The accesspoints and SSID are not showing after running the autodiscover with the templates. Has anybody else got experience with this and maybe a solution for this? We would need to get SNMP Walks from the device running that code to see how the OID structure has changed, and compare that to the script. If you want to open a support ticket, we can work with you on this. Has anyone been able to get netflow working with their Cisco WLC? I've been at this all day with no luck. 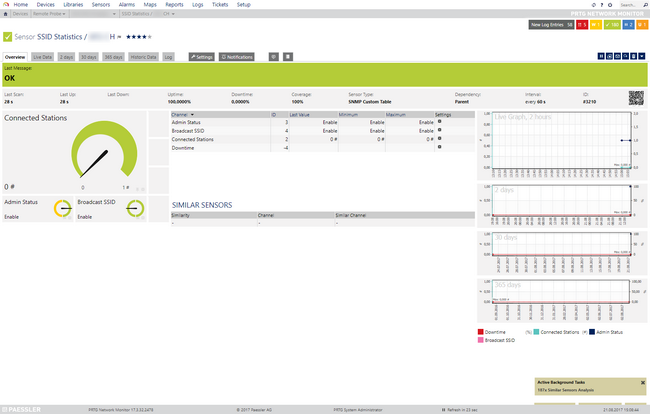 Have you been able to receive flows with the Netflow tester on your PRTG server or the probe you want them to go to? Let me know if the tester is able to get the flows or not.